Cili promotes itself as a visual and culinary celebration of the idyllic, whimsical splendor of Bali and other far-off tropical lands. : Cili --- Balinese for prosperity, good health and great fortune --- is the restaurant for the posh Bali Hai Golf Club at the south end of the Strip. 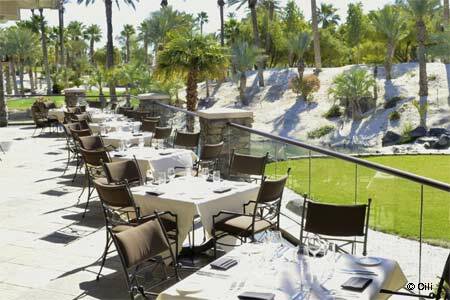 The elegant, non-smoking dining room features arched ceilings, a calming stream and mini-waterfall at its entrance, a sparkling little aquarium, and floor-to-ceiling windows with views of the golf course, swaying palms and mountains. The outdoor patio overlooks a lake on the club’s 16th hole. Cili opened in April 2001 as a Wolfgang Puck restaurant; Puck’s culinary expertise lives on with a few of his menu items, some slightly tweaked. Cream of tomato soup with basil pesto is a favorite, as is the lobster Cobb salad with mango, avocado, cucumber, egg and citrus vinaigrette. Among appetizers are the chicken quesadilla --- marinated chicken breast, peppers, onions, Oaxaca cheese, guacamole, sour cream and salsa. Served with cucumber salad, fresh fruit, fries or homemade potato chips, sandwich winners include the Snake River Kobe-style beef burger topped with roasted peppers and onions, pepper jack cheese and guacamole on a wheat or sesame seed bun. Among Asian-inspired entrées are Mongolian beef with sweet hoisin sauce, onions, bell peppers, baby corn, broccoli and steamed lemongrass rice.